Imagine you're sitting in the studio audience, dressed in your best Game of Thrones or Batman costume. Monty Hall walks right up next to you and says, "I've got a deal for you!" Can you picture it? As he does on every show, Monty points to two doors. They look identical. You can't see what's behind the doors, but the payoff is potentially great. He says, "Your transition to the cloud sits behind either door #1 or door #2. Which door do you choose? Immediately your mind begins to race as you think about your IT requirements, your current infrastructure environment, as well as budget. Which solution will be the best fit for you now, and still be able to scale with you as you grow? Which solution has the best ROI? So which door is it going to be? Fortunately for you it's 2014. You're not dressed in a funny costume and you don't have to choose right this minute. And the information you need to make the best decision for your company is just a Google away. So let's take a more pragmatic approach. In a session at VMWorld 2014, Bill Fathers, Executive Vice President & General Manager of VMware Cloud Services, simplified the transition from a private cloud to the public cloud by focusing on two choices. If you're an enterprise company transitioning from a private cloud to the public cloud, you're either going to rip and replace, or naturally integrate. IT organizations are going to rip their current hardware and licenses, and replace it with managed, pay as you go, public cloud offerings. Rip and replace will be an option for companies who wish to simply do away with their current IT methodology and replace it with something new. IT organizations are going to slowly integrate over time. As old applications reach the end of their life cycle, new cloud applications will replace the old, antiquated applications as they mature. Natural integration will be used to slowly migrate a company to the cloud which means that companies will be spending a good deal of time with one foot in the private cloud and one foot in the public cloud. Is it really that easy? Either all at once or slowly, piece by piece. As I thought about Mr. Fathers’ words, I think he is right on. And while either choice seems straight forward, it's still a major decision, and each comes with its own set of challenges to ensure you execute the transition successfully. In fact, during his VMware session Bill Fathers said, "How IT Professionals transition to the public cloud will define their career." 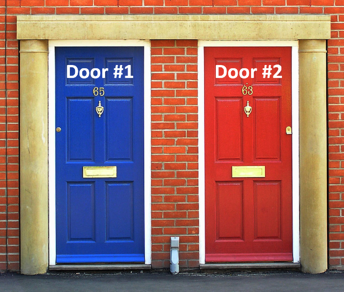 Now that we know what the two door are, let's take a look at each option to determine which is best for you. To rip and replace, you are going to look at your physical silos of compute and storage, and then you are going to simply move them to the cloud. Remember, you are ripping and replacing. The most efficient way to make that happen is to move what you are doing today to a public cloud. The silos you currently have are going to be replaced by cloud silos, so you’re simply moving your current boundaries for organizations within your enterprise from hardware you own to workload centers in the cloud. As a result, your workload, and thus your cloud efficiency, will be governed by definite boundaries. One challenge may be as you enable one group of users to meet their needs, you end up robbing from the other. Finance is still going to have its servers and resources. R&D is still going to have its own too. You’re not redesigning or redistributing, you’re just moving them. The paradigm is the same, it’s just that your resources are in the cloud. Once again, the goal of rip and replace is to efficiently move all workloads to the cloud. Therefore, it would make sense to choose a single cloud solution provider to handle all your workloads. If you choose wisely, you'll be happy with your decision, but what if don't? What if your needs change and your vendor or provider cannot change and grow with you? When all said and done, you could end up with a rigid solution that was actually intended to be a flexible deployment. All of the potential issues for #2 above, applies to deploying a proprietary public cloud solution, but potentially creates even further inflexibility as the corner you painted yourself into looks even more ominous. Moving one platform at a time to the cloud gives you control over which system or workload gets moved. That means it's up to you to set the priority, test the waters, and determine what works as you go. By methodically moving one platform at a time, you’re creating a more finite and manageable strategy to follow. This methodical approach is going to naturally facilitate a paradigm shift for how you consume resources. It allows you to free yourself of IT silos. Each public cloud solution is different with a unique set of requirements. Requirements for your Exchange server are different from your historical documents requirements. Why use the same solution for both needs? With a natural integration approach you will have the option to align the project with the best provider for that specific solution. When you bring on a new application it's nice to test it, and iron out all the wrinkles on your private cloud before you release it to the public cloud. Also, when you do put an application in the public cloud, and then realize it just doesn't work there, it's easy to bring it back to the private cloud and keep on trucking. So, where does that leave us? If you listen to what Bill Fathers said, it means you adopt a hybrid cloud methodology that follows the Natural Integration path where some workloads will remain with your hardware in your private cloud, while others will live in the public cloud and be managed by a trusted cloud provider. And as it makes sense, you can move additional workloads to the cloud. So over time, some workloads will remain in your private cloud, while others will live in the public cloud. Now back to Let's Make a Deal! You know, there is an implied third option. You can chose door #1 or you can choose door #2. Or you can choose neither of them. But remember Fathers comment; "in this day and age, the defining part of the IT organization leadership's career is going to be how the transition to the public cloud was handled." And as so many have noted, the cloud is here and it is not going away, so simply choosing "not to" is a decision that will not bode well for you personally or for your company as a whole. The public cloud is inevitable. You can either go all in at once, which may mean a painful, and perilous transition. Or, you can take it slow. Adopt a hybrid cloud stance, and move things to the cloud in a controlled, methodical way. A hybrid approach will provide all the benefits the public cloud has to offer while giving you flexibility and stability during your transition. Door #1? Door #2? The doors are open. The choice is yours. Choose wisely. What are your thoughts on natural integration? What questions or concerns do you have? If you've already move some of your organizations to the cloud, what "words of wisdom" can you share? Please include in the comments below, and I’ll be sure to reply. Matthew Brady is a Senior Consultant at Daymark Solutions and manages Data Protection Services (DPS). Matthew specializes in cloud backup infrastructure and focuses on implementing cloud backup solutions for Daymark’s clients. Matthew is certified in VMWare, Cisco, Asigra, and Microsoft.